By adding the 6001 you have converted your holster to a higher level of security. 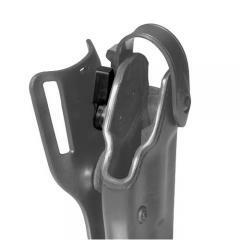 Features a uniquely designed accessory protection for the SLS holster system. Available for Model 6004, 6005, 6280, 6281, 6285, 6518, 6270, 6275, 6074, 6274, 6078, 6278, 6295, and 62955 holsters. If you feel your Safariland holster needs even more security, I recommend adding a Sentry. It's a bit much on a Level 3 or 4 holster as once you lock your Sentry on one of these it practically takes an act of Congress to access your weapon, but it's a very good extra bit of piece of mind on a Level 1 or 2. Easy to install, once you train it becomes second nature. Upgrade to sentry 3 is One of the best decision I've made, give me the extra security i was looking for. Take some practice to get use to the thumb breaker but works without fail and I highly recommend sentry level 3 kit for individuals who uses safriland products. I have one of these on all my holsters. Works better than what I expected. Would highly recommend this. It is a little stiff, but good security. You can always count on Safariland to deliver a quality product. Does what it is suppose to do. I recommend it.